This section explains in detail how to use the command for the assignment of materials managed via the dialog box for the assignment of materials. The command is activated using button. Once the selected material is activated and a part is selected using the cursor, the material will be assigned to that part. If you are working with coating (eg. edge banding material) you will have to select the edges of the part. The material is added to the definition of the part component, so the specified material will be assigned to all instances of this component. If you want to assign the material to a single instance of the selected component, you will have to select this component and right-click the mouse to open the context menu and mark this component as unique (MakeUnique). Then, this material will be assigned to the unique instance of the part only. Types of rendered characteristics depend on the type of material. In case of laminated board (Laminatedboard), the icon of the material is divided into two halves. 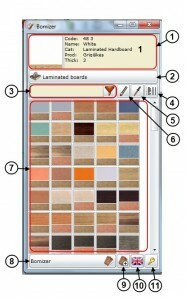 The first half of the icon shows the color of the laminate, while the second shows the board. Displayed thickness “S” depends on the thickness of material. 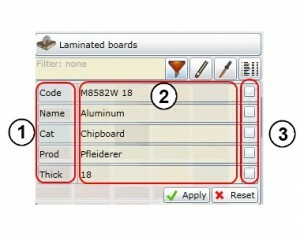 This way, the user can easily identify the thickness of the board when selecting it based on the image. The first half of the icon shows the color of the edge banding; the color of the second half shows the thickness of the edge banding. Currently, the colors are assigned to the thickness values of the edge banding as follows. When creating new materials, you can add new thickness values, i.e. other than the above. The next characteristic “S” of the second half of the icon shows the thickness of the edge banding, for example, 22 mm, 28 mm, 32 mm, etc. The thicker the edge banding, the greater is the thickness of the edge banding in the icon. This helps the designer to easily identify the selected edge banding. Keep in mind that you can use various filtering options for all warehouse components, narrowing the search of the required edge banding. Please note yet another feature of the icon: if you place the cursor on the second half of the icon “2” and click on it, all edge bandings of the same thickness will be painted with the appropriate color. When you click again, the color of the edge banding is restored. This option helps the designer to easily determine the thickness of edge banding used for the edges of the parts. By clicking this button, we can select the type of material to be used. The first section includes field names, values of which are given in the second section. 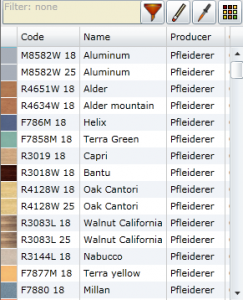 Having selected the desired field, you can enter a text string used to search for the material. For example, if you enter “Buk” in the Name box, you will get all the materials that include “Bukas” (beech) in their names. To activate the filter, check the box in the third section. As shown in the figure, you can create compound filters. For example, you can search for all boards named “Bukas” (beech) with the thickness of 18 mm. In the figure, you can see a box next to the filter button. It is a quick search filter. It allows the user to refine the search quickly in the completed search list. 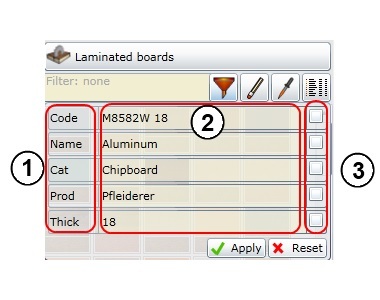 For example, in the figure you can see how 25 mm thick boards are eliminated from the filter list. 2. Display using a list. When data are displayed in the list, all data will be sorted by the values in a column in ascending or descending order, once the column header button is clicked. When the part is shown on the screen, this button is used to read and activate its material, so that it can be assigned to other parts. In this way, the material can be assigned by selecting it from both the warehouse (database) and the list of materials already assigned to the model. If the material is removed from the definition of the part component, then the material will be removed from all instances of the component. If you wish to keep the material for a single component, you will have to mark this component and right-click the mouse to open the context menu and mark this component as unique (MakeUnique). In this window, you can see a set of currently used materials. It may include the entire content of the database or a filtered content. The user can create and use sets necessary for their work only, using the entire content of the database. 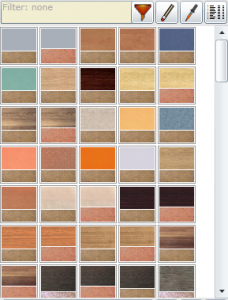 It is possible to create several sets, for example, Moderncolors, Retrocolors, etc. This command is used to edit the materials database. The user can create their own materials database and use it in their work. Materials that have been created this way will be available only to the group of that user. If you wish to publish these materials for the remaining users of the system, you will have to obtain permission of our administrator. Currently, the system supports English, Russian, Polish and Lithuanian. By logging out of the BOMIZER system, the user leaves their workstation. Now, the user can go to another computer and log in to continue their work.